After our three week stint in Dallas, we ended up returning to the Hill Country of Texas to stay in the quaint town of Fredericksburg for a few days. Yes, we were just down in Austin for a whole week, a short sixty miles away from where we were staying; Fredericksburg would have been a do-able day trip. 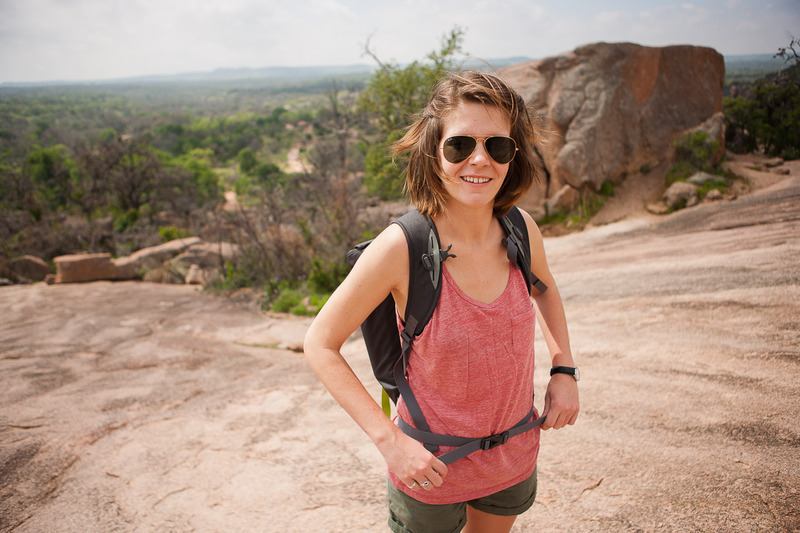 But our time in Austin was filled with so much driving around, spending time with friends and trying to cross as many suggestions off the map as we could, that we didn't have time to do what I was most looking forward to: a hike to the top of Enchanted Rock. 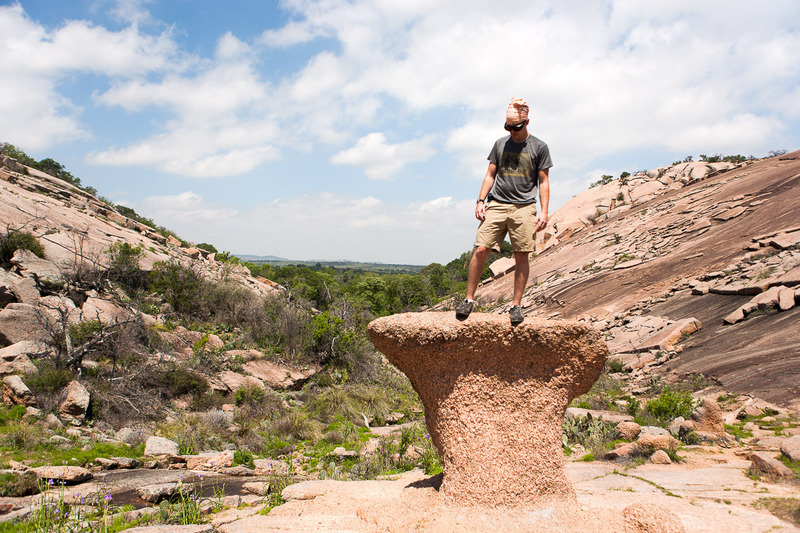 Enchanted Rock is a big ole pink granite monadnock (an isolated, usually bald mountain that rises suddenly from a flat plain) located about fifteen miles north of Fredericksburg. 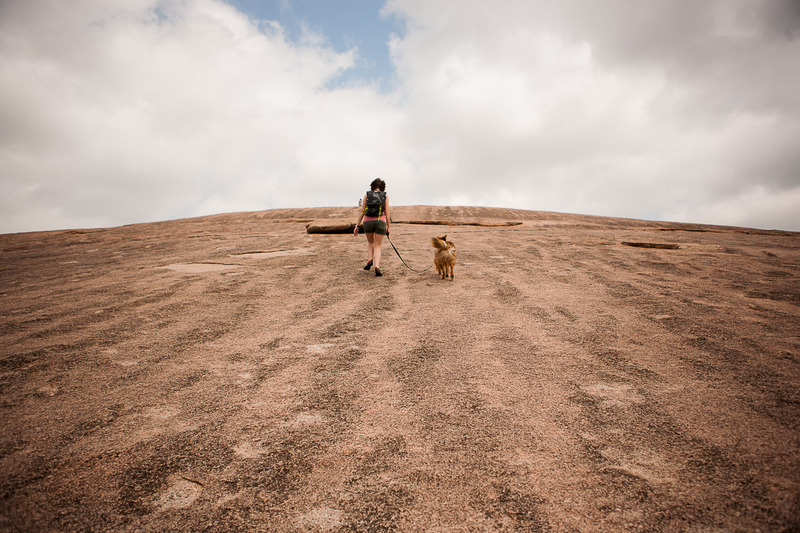 There are multiple hiking trails within the Enchanted Rock State Natural Area, the most popular being the Summit Trail, a 0.6 mile hike climbing 425 feet up the smooth granite to reach the top of the dome. It's name is attributed to local Indian folklore, which describes the rock as having magical and spiritual powers. We were especially excited for our first hike with our new pup, Bulleit. He was still adjusting to his new life on the road with us, but we figured a hike in the great outdoors would be good for all three of us. After a half-hour drive along the bluebonnet and wildflower lined highway, we saw the granite dome rising above the blooming trees. Once we parked, we decided to climb the Summit Trail first. Nearly a constant upwards slope, the subtly marked trail is mostly on smooth pink stone, with mini-oases sprouting cacti and grasses every fifty feet or so. Bulleit happily enjoyed the uphill climb, especially the last half when the wind picked up. After the steepest part of the climb, we finally reached the top. Wind whipped around us as we walked over the flat, otherworldly summit, surveying the surrounding land from 425 feet above. We spent a few minutes photo-shooting Bulleit, who was majestically tousling his mane in the strong wind, before we descended a bit towards a cave marked on the map. We found a cluster of boulders with a plaque reading "CAVE ENTRANCE". I guess we found the cave. I squeezed through an opening in the rocks, followed by a skeptical Bulleit and John, who was encouraging him to follow me. We crawled until we reached a clearing, where there was a crevice to climb further down. 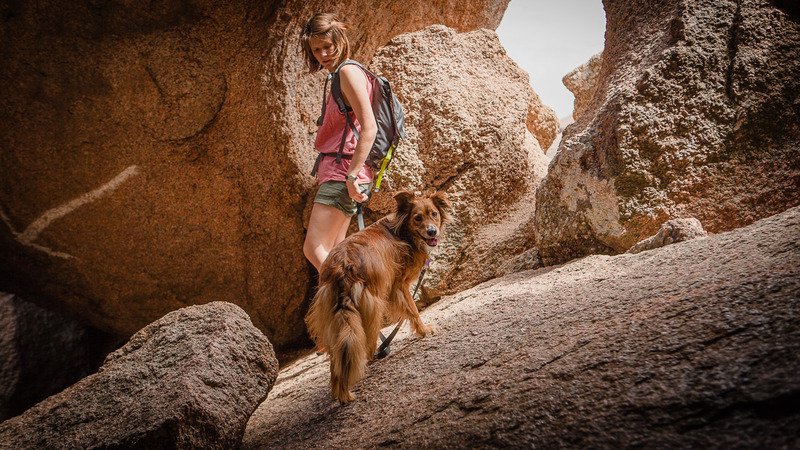 Dogs aren't very good spelunkers, so we turned back to climb out of the cave and descend down the rock. We turned onto a trail that circled around Enchanted Rock, assuming it would be nice and easy. To our dismay, it turned out to be much longer and much hotter than we expected. Near the end of the never-ending trail, we spotted a stream. 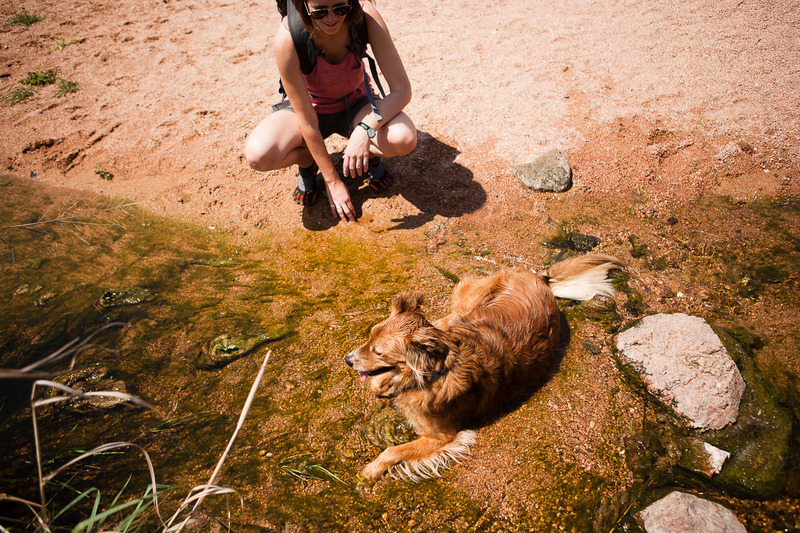 Bulleit meekly placed one paw in the cool water and immediately plopped down in the middle of the stream. He slept like a baby that night. Bulleit cooling off in the stream. He would not move. Our first hike was an overall success. We were relieved to find that Bulleit enjoyed hiking as much as he likes napping on the couch. It was nice to have spent some more time down in the Texas Hill Country, but we were ready to head west. Special thanks to Alex B. (who suggested hike the granite batholith) for making this blog post possible!